The General Carl A. Spaatz Award is Civil Air Patrol’s highest cadet honor. It is presented to cadets who have demonstrated excellence in leadership, character, fitness, and aerospace education. Cadets qualify for this prestigious award after devoting an average of five years to progress through sixteen achievements in the CAP Cadet Program. Along the way they develop self-discipline, a strong sense of personal responsibility, the ability to lead and persuade, and the foundation necessary for pursuing a career in aviation, space, or technology. The final step a cadet must complete to earn the Spaatz Award is a rigorous four-part exam consisting of a challenging physical fitness test, an essay exam testing their moral reasoning, a comprehensive written exam on leadership, and a comprehensive written exam on aerospace education. Upon passing the Spaatz Award exams, the cadet is promoted to the grade of cadet colonel. The Spaatz Award is named in honor of Carl “Tooey” Spaatz, the first Chief of Staff of the United States Air Force. One of the giants in the history of airpower, in 1929 Spaatz, together with another pilot, set an important flight endurance record of 150 hours and 40 minutes in the early days of aviation. During World War II, he commanded the Allied air campaign against the Nazis. In the Pacific Theater, the atomic bombing of Hiroshima and Nagasaki took place under his command. 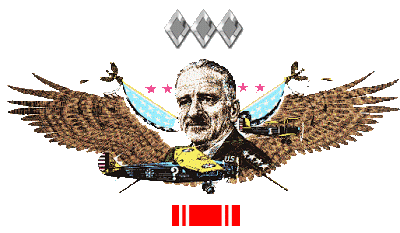 After retiring from the Air Force, General Spaatz served as the first chairman of the Civil Air Patrol National Board. 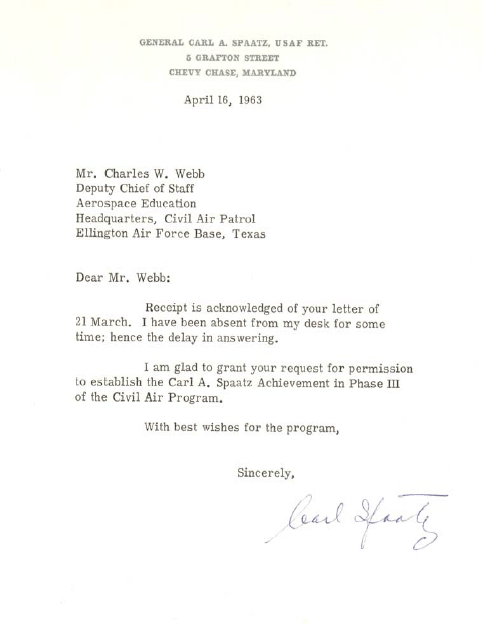 A letter from General Spaatz authorizing the use of his name on the highest Civil Air Patrol cadet award. On average, only five cadets in one thousand earn the Spaatz Award. Since the award’s inception in 1964, Civil Air Patrol has presented the Spaatz Award to only 2,000 cadets nation-wide (as of August 2015). Spaatz Cadets are expected to serve as role models for junior cadets, and become leaders in their communities as they enter adulthood. The first recipient of the Spaatz Award, Michigan’s Douglas C. Roach, served as a pilot with the Air Force Thunderbirds.